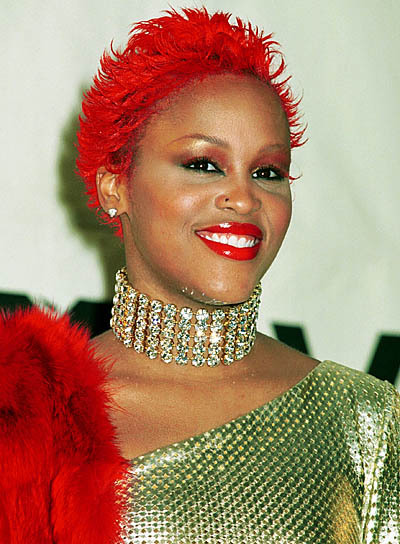 Eve's short and spiky red hairstyle is guaranteed to be a show stopper. What to do: 1. If you want red-hot hair color, like Eve's, head to the salon. This two-step process is way too tricky to do yourself.2. To style, use a gel on damp hair. Alternatively, try glue or putty (the ones made for hair, of course).3. Spike your hair by pulling up small sections on top. At the sides, pull the sections up and away from your face. As you pull up on each section give it a little flip at the tips.4. For extra hold, use hairspray. If your spikes droop, hold them up individually, spritz each one with hairspray and keep holding until the hairspray dries.